For other uses, see Dubravka (disambiguation). 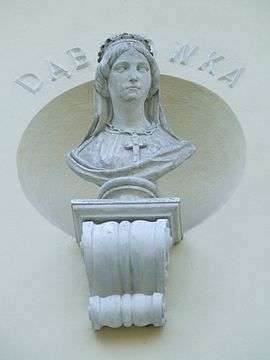 Doubravka of Bohemia or Dobrawa, Dąbrówka (Czech: Doubravka Přemyslovna, Polish: Dobrawa Przemyślidka, Dąbrówka Przemyślidka) (ca. 940/45 – 977) was a Bohemian princess of the Přemyslid dynasty and by marriage Duchess of the Polans. Dobrawa's date of birth is not known. The only indication is communicated by the chronicler Cosmas of Prague, who stated that the Bohemian princess at the time of her marriage with Mieszko I was an old woman. The passage is regarded as tendentious and of little reliability, and some researchers believe that the statement was made with malicious intent. It is possible that in the statement about Dobrawa's age, Cosmas was making a reference to the age difference between her and her sister Mlada. That would give him a basis for determining Dobrawa as "old." It also found that Cosmas confuses Dobrawa with Mieszko I's second wife Oda, who at the time of her marriage was around 19–25 years old, a relatively advanced age for a bride according to the customs of the Middle Ages. Some researchers have taken up speculative views, such as Jerzy Strzelczyk, who assumed that in the light of contemporary concepts and habits of marriage of that time (when as a rule marriages were contracted with teenage girls) is assumed that Dobrawa had passed her early youth, so, it's probable that she was in her late teens or twenties. Nothing is known about Dobrawa's childhood and youth. 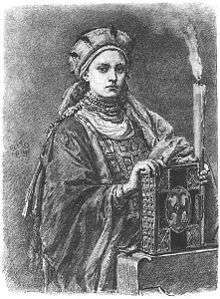 In 1895 Oswald Balzer refuted reports that previous to her marriage with Mieszko I, Dobrawa was married to Gunther, Margrave of Merseburg and they had a son, Gunzelin. This view is based on the fact that Thietmar of Merseburg in his chronicles named Gunzelin, Gunther's son, brother of Bolesław I the Brave, Dobrawa's son. Currently, historians believed that Gunzelin and Bolesław I are in fact cousins or brothers-in-law. In the second half of 964 an alliance between Boleslav I the Cruel, Duke of Bohemia, and Mieszko I of Poland was concluded. In order to consolidate the agreement, in 965 Boleslav I's daughter Dobrawa was married to Mieszko I. There was a difference of religion between the spouses; she was a Christian, he was a pagan. Two independent sources attribute to Dobrawa an important role in the conversion to Christianity of Mieszko I and Poland. The first is the chronicles of Thietmar, who was born two years before the death of Dobrawa. He wrote that the Bohemian princess tried to persuade her husband to accept Christianity (even at the cost of breaking their marriage and with it the Polish-Bohemian Alliance). In the end, she finally obtained the conversion of Mieszko I and with him, of all Poland. In turn, the 12th century chronicler Gallus Anonymus says that Dobrawa came to Poland surrounded by secular and religious dignitaries. She agreed to marry Mieszko I providing that he was baptized. The Polish ruler accepted, and only then was able to marry the Bohemian princess. However, modern historians allege that the baptism of Mieszko I was dictated by political benefits and should not be attributed to any action of Dobrawa, who according to the modern view had virtually no role in the conversion of her husband. They note that the conversion of Mieszko I thanks to Dobrawa formed part of the tradition of the Church which stressed the conversion of Pagan rulers through the influence of women. On the other hand, literature doesn't refuse to give Dobrawa a significant role in the Christianization of the Poles. In her wedding procession, she arrived in Poland with Christian clergymen, among them possibly Jordan, ordained the first Bishop of Poland in 968. Tradition attributes to Dobrawa the establishment of the Holy Trinity and St. Wit Churches in Gniezno and the Church of the Virgin Mary in Ostrów Tumski, Poznań. Dobrawa's marriage cemented the alliance of Mieszko I with Bohemia, which continued even after her death. On 21 September 967 Mieszko I was assisted by Bohemians in the decisive battle against the Wolinians led by Wichmann the Younger. When, after the death of Emperor Otto I in 973, a struggle for the supremacy in Germany began, both Dobrawa's husband and brother Boleslav II the Pious, Duke of Bohemia, supported the same candidate for the German throne, Duke Henry II of Bavaria. Bolesław I the Brave (Chrobry) (b. 967 - d. 17 June 1025). a daughter, perhaps named Świętosława, perhaps identical to the legendary Sigrid the Haughty (b. 968/72 - d. ca. 1016), perhaps married firstly with Eric the Victorious, King of Sweden, and later wife of Sweyn Forkbeard, King of Denmark, by whom she is said to have been mother of Canute the Great, King of Denmark, Norway and England. Gunhilda of Poland, who married Swyen I "Forkbeard", King of Denmark and England, is usually identified with Sigrid. There is an hypothesis asserting the existence of another daughter of Mieszko I who was married to a Pomeranian Slavic Prince. She could have been the daughter of either Dobrawa or one of Mieszko's previous pagan wives. Also, a theory has been advanced (apparently recorded by Thietmar and supported by Oswald Balzer in 1895) that Vladivoj (c. 981 – January 1003), who ruled as Duke of Bohemia during 1002–1003, was another son of Dobrawa and Mieszko I. Although modern historians have rejected this hypothesis, Czech historiography has supported the notion of mixed Piast-Přemyslid parentage for Vladivoj. Dobrawa died in 977. In his study of 1888, Józef Ignacy Kraszewski wrote that "her tomb was discovered in Gniezno Cathedral. It was a simple stone marked with a cross. Purple robes and a weighty gold loincloth were the only objects found in her tomb." A similar view of Dobrawa's burial place was expressed earlier, in 1843, by Edward Raczyński in his study Wspomnienia Wielkopolski to jest województw poznańskiego, kaliskiego i gnieźnieńskiego (Memories of the Greater Poland districts of Poznań, Kalisz and Gniezno). However, the burial place of the Bohemian princess is now considered to be unknown. Dobrawa's death weakened the Polish-Bohemian alliance, which finally collapsed in the mid-980s. ↑ Marek, Miroslav. "Complete Genealogy of the Přemyslid dynasty". Genealogy.EU. ↑ Chronicle of Cosmas of Prague: translated, introduction and commentary developed by Maria Wojciechowska, Warsaw 1968, lib. I cap. 27, p. 149. ↑ H. Łowmiański, Religia Słowian i jej upadek, Warsaw p. 338, footnote 889. ↑ J. Strzelczyk, Bolesław Chrobry, p. 15. ↑ Thietmari chronicon, vol. V, cap. 18, p. 274; vol. V, cap. 36, p. 300; vol. VI, cap. 54, p. 390. ↑ View, inter alia, of Herbert Ludat. ↑ Date fixed by H. Łowmiański, Początki Polski, vol. V, p. 548. ↑ Thietmari chronicon, vol. IV, cap. 56. ↑ J. Dowiat, Metryka chrztu Mieszka I, p. 79; Andrzej Feliks Grabski, Bolesław Chrobry. Zarys dziejów politycznych i wojskowych, p. 26; S. Trawkowski, Monarchia Mieszka I i Bolesława Chrobrego, pp. 116-117; H. Łowmiański, Początki Polski, vol. V, p. 549. ↑ A. F. Grabski, Mieszko I, Warsaw 1973, p. 93. ↑ Krzemieńska, Barbara (1999). Břetislav I.: Čechy a střední Evropa v prvé polovině XI. století [Bretislaus I: Bohemia and Central Europe in 1st Half of the 11th Century] (in Czech) (2nd. ed.). Praha: Garamond. pp. 28–29. ISBN 80-901760-7-0. ↑ E. Raczyński, Wspomnienia Wielkopolski to jest województw poznańskiego, kaliskiego i gnieźnieńskiego, Poznań 1843, vol. II, pp 356-360. ↑ K. Jasiński, Rodowód pierwszych Piastów, p. 78.